Over the millennia our species has developed a complex symbiosis with our environment. Earth is our home. Everyone you have ever loved, every experience you have ever cherished, and every possession you have ever coveted, is a product and aspect of the Earth. At this point and time we stand at the precipice of a new and important era. As our society rapidly develops, our planet is being devastated and our precious resources are being depleted. We all know and fear what could be on one side of this situation. We fear natural devastation, nuclear wars and genocide, endless impoverishment, starvation, war, disease, and death. But a new vision is emerging. All throughout the globe, people are coming together to celebrate our precious planet and to envision new ways to live in harmony with the Earth. Communities and alliances are forming that respect the Gaian entelechy, and seek to follow the natural wisdom of the Earth, rather than nihilistically ravishing the very source of our being and destroying the prospects of our future generations. 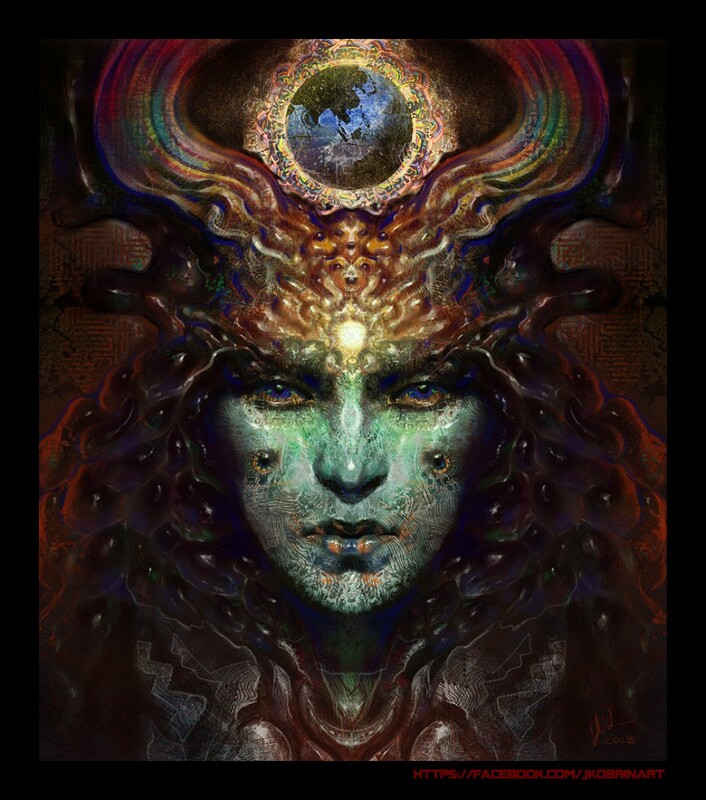 This artwork GAIAN ENTELECHY is a tribute to this emerging visionary culture. It is a representation of the Earth spirit, of a noble consciousness that exists within the natural world. The Earth is alive. And we are a part of it. We all have access to the Gaian entelechy, in so much as we are all an integral part of the Earth. The idea of us existing as separate entities upon the Earth is a falsehood. The truth is that we are only one Earth. The Earth is a living organism, in the same way that billions of individual cells comprise a human being. And so a person who lives in an urban setting is in no way less in touch with the Gaian entelechy, because cities and their inhabitants are products and aspects of the Earth as well. 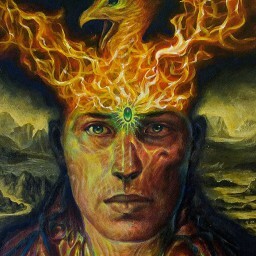 Terence McKenna held the belief that the Gaian entelechy was accessed through entheogenic trance, that when you take of the Earth in the form of Ayahuasca, cacti, or mushrooms, you are actually allowing yourself to be shown the wisdom of the Earth through direct experience. He believed that you experience a form of communication that exists within the plant kingdom at a molecular level and that the plants (and nature in general, as a whole) are teaching human beings how to live with insights wrought from the entheogenic trance. Whether or not this is the case, I believe the Gaian entelechy is, essentially, intuition. The Earth knows what it’s doing, and as manifestations of the Earth we need only to look within and trust in our intuition to act in accordance with the natural world. The problem is that most people haves strayed so far from listening to their own hearts and intuitive senses that the human race has strayed away from the Gaian entelechy and began to ravish the natural world. I believe the solution to this is to strip away the mental noise that clouds intuition, whether it be through meditation, entheogens, or whatever have you. Fine artist, Live Painter, Illustrator, graphic designer.